I use a FormLabs Form 2 printer whenever I need detailed, high-quality, smooth prints. The results are fantastic, but recently I needed to change the color of some small parts. The parts were so small and finely-detailed that I wanted to avoid paint if possible. FormLabs sells a color kit where you can make a batch of resin into any color you want, but I didn't need or want to buy a whole separate batch of resin; I just needed to do a few small pieces. I decided to try dyeing the parts, and the results were fantastic. I purchased some liquid Rit Dye ("Chocolate" color for synthetics in my case) from Amazon; it's intended to change the color of synthetic fabrics. Since synthetic fabrics are basically plastic, I figured it might work out okay to dye my 3D prints, which are also plastic. This kind of simpleminded reasoning was all I needed to give things a shot. Testing consisted of simply filling a plastic cup part way with very hot (but not boiling) water. Then I poured in a small amount of the liquid dye; I didn't measure anything, but it was probably a couple of teaspoons. Then I dropped in a test piece, which was a scrap base and support structure. I stirred it a few times over five minutes, then removed and rinsed it. The result is shown below on the right. Plain Grey FormLabs resin on the left. On the right is also Grey resin, but after five minutes of dyeing. The results were impressive! I was expecting only to get a rough idea of whether this might work, and what direction to go in next. Instead, it worked beautifully on the first try! The color was even and smooth. I decided to do a production piece. Five minutes seemed plenty so I did four minutes. The results are below. On the left are regular prints, on the right are the dyed pieces. 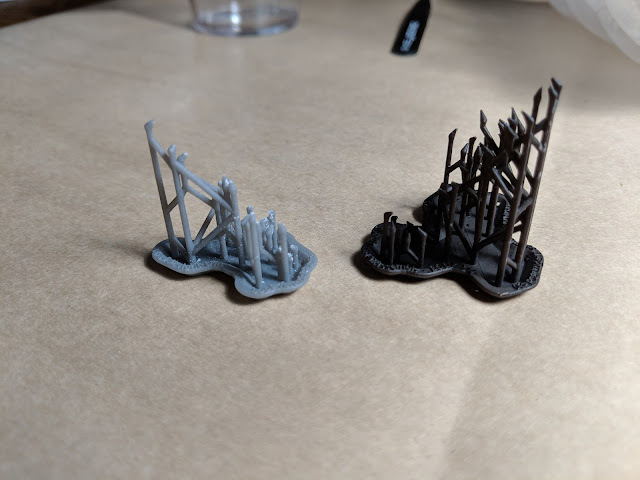 Left: undyed Grey FormLabs resin results. Right: results from four minutes in dye solution. I honestly hadn't expected the results to be so good and so easily done. There is more to be learned, but if you're looking to dye a small 3D print out of a FormLabs printer, it's awfully easy and fast to do so with the liquid Rit-Dye and some hot water. 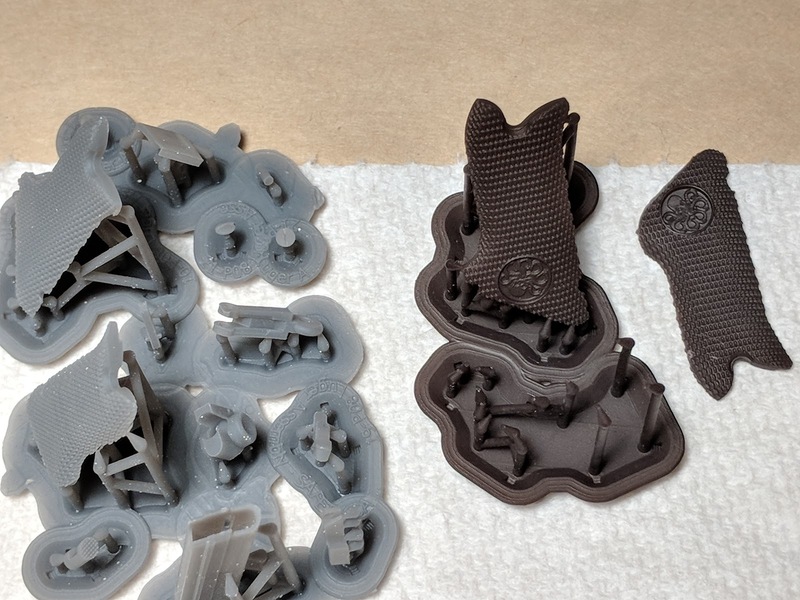 Probably this is feasible for other 3D prints and other resins; I haven't tested any, but the results here were so readily done that it certainly looks to be worth trying out.